I don’t ever recall getting excited about coleslaw. Don’t get me wrong – I love coleslaw! But it can also be boring. It’s one of those dishes that is just always there, on the side of your plate, non-threatening and reliable. And sometimes you just don’t want boring old coleslaw. That’s why I came up this recipe. I wanted a unique Artichoke & Roasted Red Pepper Coleslaw; something different from the usual. My Mom makes a pretty darn good one and her magic ingredient is caraway seed. I’ve incorporated that yumminess into this coleslaw, as well as the addition of roasted red peppers and artichoke hearts. 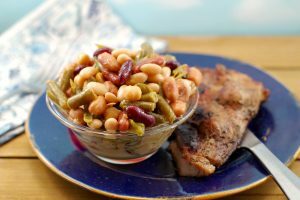 It’s only 2 Weight Watchers freestyle smart points per serving and it changes things up nicely! Okay, now you can get excited about coleslaw! Although coleslaw is typically healthy, the creamier recipes can be high in calories and fat. That’s why apple cider vinegar coleslaw is a great choice! This recipe also contains a little low-fat mayonnaise so you don’t miss the creaminess. Coleslaw is all fine and well on the side of your plate, but in the last couple of years I have discovered even yummier uses for it, like on my Slow Cooker Pulled Pork on a Bun and in my No Fishy Taste Fish Tacos! 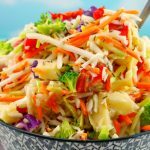 Although they both have their own recipes in the posts, this healthy coleslaw recipe also works marvelously with them and changes things up, just to add a bit more excitement. However, it stands alone just as nicely. Where does coleslaw come from? 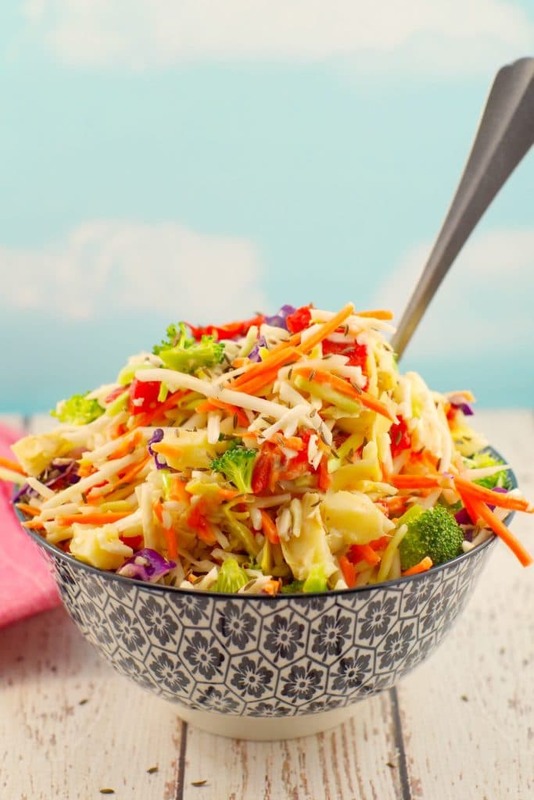 Although it’s evolved over time, nowadays, the word slaw is no longer limited to just coleslaw and pretty much includes any type of dressed salad with shredded vegetables. 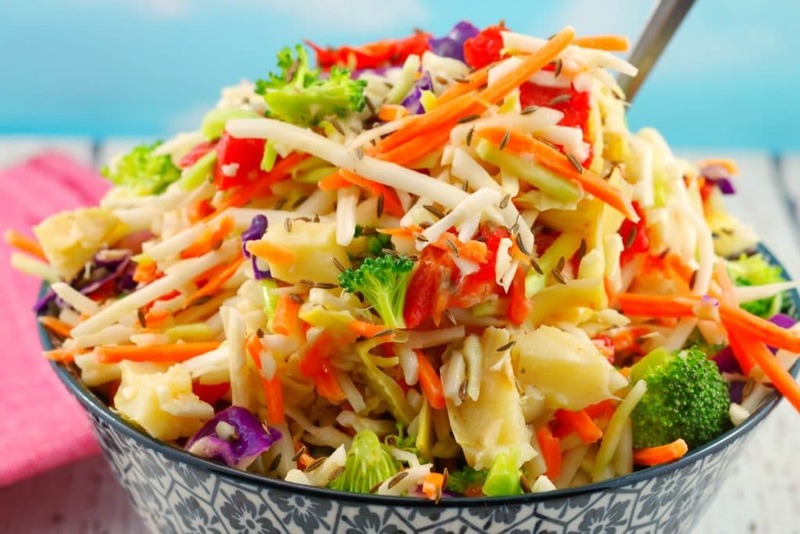 However, the term coleslaw originally came from the Dutch term koolsla, meaning cabbage salad. 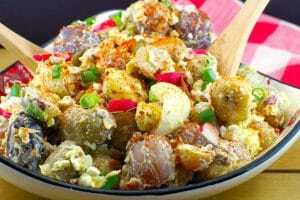 Kool is the Dutch word for cabbage and the sla part is a Dutch abbreviation of the word salade. If you are interested, you can read more about that HERE. So, if you want to get excited about coleslaw, then make this tangy Artichoke & Roasted Red Pepper Slaw! 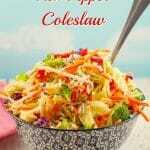 Coleslaw is a great side dish for a picnic! 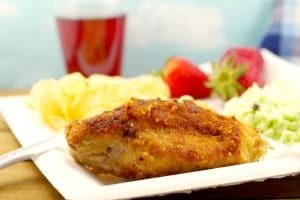 And again, if you’re looking for something that’s not boring or the same old same old, then give my Fried Caesar Chicken a try- it’s the perfect pairing with this coleslaw! AND…..If you are looking for additional unique side salads that are also great for picnics, then check these out! In a small bowl, whisk together sugar, apple cider vinegar and light mayonnaise. 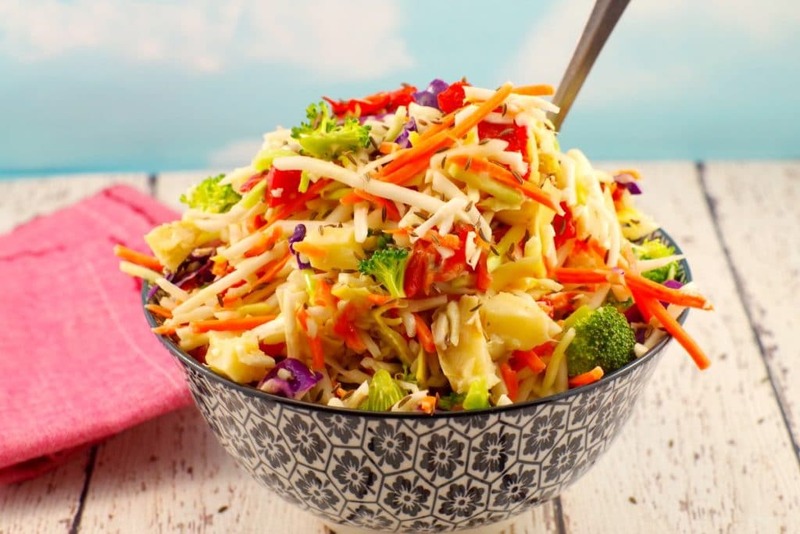 Mix broccoli slaw, artichoke, red pepper and caraway seed together, then mix in dressing and stir until combined. You can sprinkle a TINY bit of caraway seed on for a garnish, but more is less when it comes to caraway seed. The flavor can overwhelm, so be careful not to use too much! Coleslaw is often provided at restaurants as a side dish for Fried chicken. But we feel bored by it tasting same always. 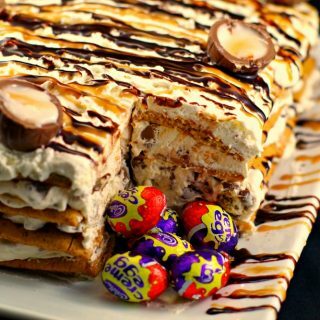 You have made it very tasty with your recipe. It’s the first time I have seen someone experimenting with coleslaw recipe. I hope this recipe would give an interesting taste to coleslaw. All the wishes for your new recipes! Thanks so much – glad you enjoy it!